Duramax Fifth Generation: 2011-2016 (LML) Discuss the fifth generation (2011-2016) of the 6.6L Duramax diesel engine & associated components. Engine related discussion ONLY. Last edited by G2GBY; 09-07-2018 at 09:57 AM. Careful there...that looks like NoX sensors, not EGT sensors. Thanks for setting me on the right track. I’ll have the Mods remove my nonsense. All the P0420 threads I find it’s either the Indirect Fuel Injector or NOX Sensor. Post #14 Well, you can keep your fingers crossed regarding tightening the fuel cap, because the code P0420 has absolutely nothing to do with the fuel tank. P0420 is an indication that the NOX readings in the exhaust are out of spec. There is a NOX sensor upstream and a NOX sensor downstream of the SCR. They do a comparison to check that the SCR is doing its job of reducing NOX. The downstream NOX should be less than 10% of the upstream NOX, and is often a much lower percentage when the SCR is working correctly. So, if you have a P0420 code, something is causing the NOX to be out of spec. In Mexico it is commonly due to sulfur in the fuel, but in the USA and Canada, unless someone is using very old diesel fuel, it would be indicative of a faulty component. The NOX sensors are more suspect than anything else, but the dealer is SUPPOSED to go through a full diagnostic procedure which includes a Service Regeneration, and or DEF Quality Test Procedure. Last edited by G2GBY; 09-07-2018 at 10:19 AM. Not saying that the NOX sensors couldn’t have a hand in this issue but am I wrong to think that it is in fact more likely to be the 9th injector itself or the 9th injector in association with one or both EGT sensors? Second question is, should I replace the 9th injector itself or the entire 9th injector assembly of it is a scenario of it being fouled or bad? 2013 LML LTZ crew cab Duramax 145,000 miles. The indirect injector is likely the failure, myself I’d replace that first. You’ll need a small quick-connect disconnect tool to detach it from the feed line. There’s a small retainer that’s hard to tell it’s even there that has to be popped out and slid back up the feed pipe for access to put the tool in. You’ll need to run a regen with a scan tool to purge air from he new injector after install. You can re-evaluate after replacement to see if a EGT sensor may be faulty too. Usually if ones bad it will set a code specifically for a sensor. Last edited by rob1; 09-07-2018 at 10:42 PM. Similar to P24A0 Diagnosis. This code commonly sets due to a Hydrocarbon Injector failure. Check EGT sensors first, see P24A0. 1) Perform the regeneration and note the exhaust temperature sensor #2 to be over 1000 degrees with temperature sensor #1 more than 600 degrees. 2) If the #2 exhaust temperature is cool, remove the hydrocarbon injector from the exhaust downpipe (the electrical portion of the injector is on the right hand valve cover). 3) With the engine running, energize the hydrocarbon injector using an injector driver tool or other suitable means and expect fuel to exit the injector nozzle. If no fuel, replace the injector and verify diesel fuel is present at the injector during disassembly. This code commonly sets due to a Hydrocarbon Injector failure. 1) Let the vehicle and exhaust cool to ambient air temperature and then using the scan tool, check all 4 exhaust gas temperature (EGT) sensors. They should read ambient. 2) If any of the EGT sensors do not read ambient air temperature, check the resistance of the EGT sensor and compare the sensor reading with the temperature versus resistance chart in document ID 1847002. 3) If the EGT sensor is not within the resistance chart specification, replace the EGT sensor. 4) If all sensors are reading the same ambient air temperature: Start the vehicle and bring the vehicle up to operating temperature. Using the scan tool, command DPF regeneration while monitoring EGT sensors 1 and 2. 5) During a DPF regent, EGT1 should be between 482-752 degrees Fahrenheit, and EGT 2 should be the hottest of all the sensors in the range of 1022-1292 degrees Fahrenheit. 6) If the EGT2 is less than 1022-1292 Fahrenheit, check the intake system for leaks or restrictions, Exhaust system for leaks or restrictions, Exhaust Aftertreatment Fuel Injector for correct flow, Exhaust Gas Recirculation (EGR) for normal flow, turbocharger for normal operation. 7) If everything checks OK, test the Hydrocarbon Injector for proper flow and operation. See P0420. 9th injector assembly will be here tomorrow morning. I will replace it and have worked out a deal with a friend that has the scan tool to force the regen. Pray that it is only the 9th injector and that my novice mechanical skills can replace it easily. 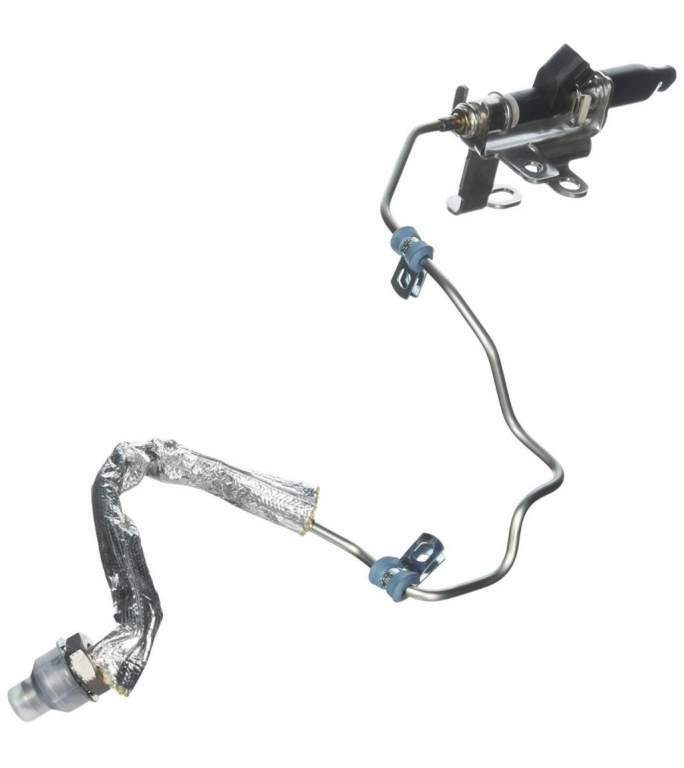 If you don't have the fuel line release tool you will really fight it. One easy way to check your EGT sensors is wait until the truck is cool, as in have it sit overnight then hook up your scan tool and check and see if both EGT sensors are at ambient temperature. If one is out of spec it will show a bogus reading. Just an update for anybody who would like to know. Truck is fixed. I replaced the 9th injector assembly. The old one’s nozzle in the down pipe was completely covered and clogged with soot from the truck idling more than it should. Took it the shop to have force regen done and those people must have just been clueless. Took it to another local shop that is more of a performance truck center and her forced regen while driving the vehicle had it fixed and cleaned it less than a couple of hours. Truck is no longer in limp mode nor has reduced engine power. Fuel mileage went back up from 9.8 to 18.7 while he was driving it. Now he did not check the EGT sensors or NOX sensors as I am planning to delete the truck in the near future. I hope that this feedback helps. willydmax, SRex, davester and 1 others like this. thanks for posting your fix. In order to be able to post messages on the Diesel Place : Chevrolet and GMC Diesel Truck Forums forums, you must first register. PLEASE READ! You must check your email inbox for the confirmation link to complete registration. Please check your spam box if you do not see the email in your inbox.